The MET office lied again. By the time I’m repitched at a Swanage campsite (this one thankfully has grass instead of stone) the threat of rain has departed. There’s another 10 mile walk I had in mind but is it too late to embark at 3pm? Nah. My ambivalence stems from the knowledge that today’s jaunt will be less challenging than Mondays affair, but also there is a pub I am gagging to visit. 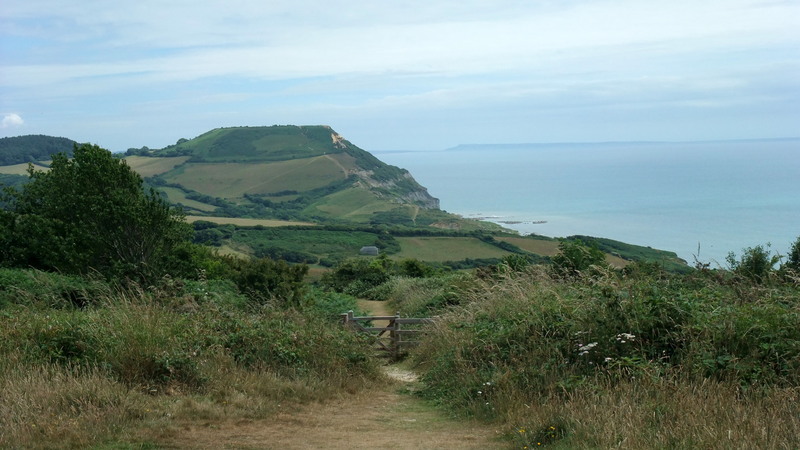 The coastal trail winds south out of Swanage with the climb rewarded by views over the bay. The walk is never challenging but never dull. 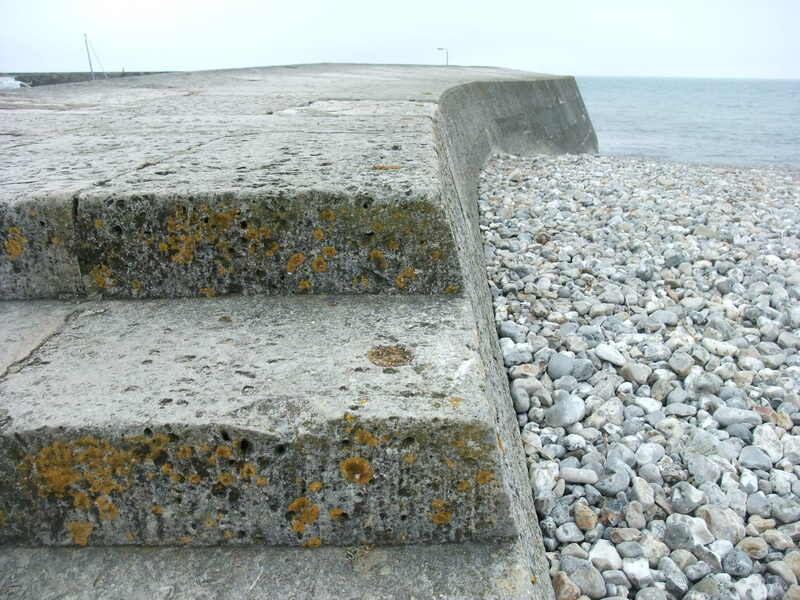 The path hugs the cliff tops passing a dolphin observation hut (no – I didn’t see any) a functioning lighthouse and a succession of old quarries sliced angularly into the shoreline. I wonder how many old buildings I have walked past might have been hewn of stone cut from these quarries 200 years ago. A wonderfully engaging couple from Kansas share a few travel stories with me. They want to point out that they live in an enlightened university town – an enclave of academia surrounded by the all-pervasive bible belt the area is better known for. Next stop London and then onto Venice, Florence and Rome. Americans suffer a tenuous reputation at times but whenever I have met them they have been courteous, knowledgeable folk. On the news we mostly tend to hear about the Sarah Palin types who fail to see beyond their own back yard. As the coastal leg of my circular walk nears its end my stride pattern matches that of a fellow walker. It turns out that Steven is a fascinating guy. He has come over from Germany to visit his retired father who lives in Bournemouth and now has a couple of weeks to walk the coast according to whatever schedule he feels like. 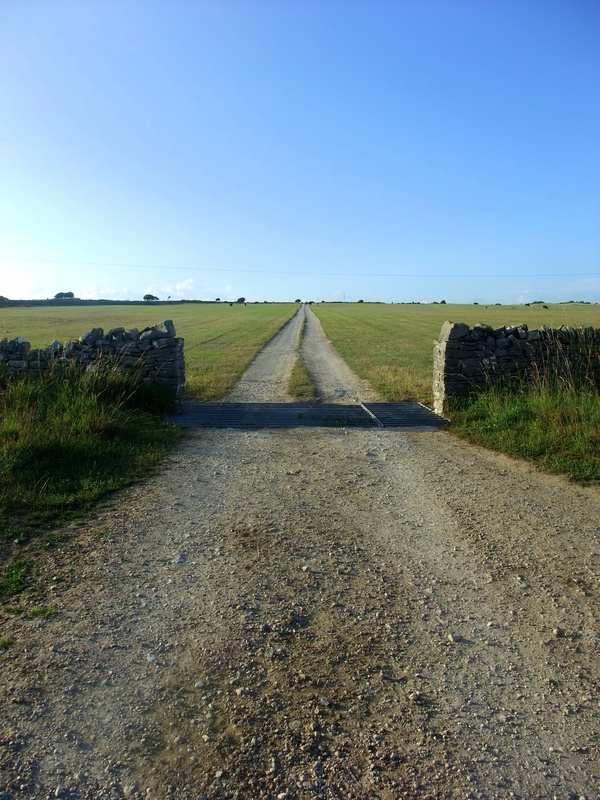 He has booked lodgings in the village of Worth Matravers and I’m also headed that way. His walk started at Poole this morning so he has a good 8 mile start on me and is lugging the world on his back but seems not to feel it. The much anticipated Square And Compass Pub exceeds my expectations. This old timber beamed inn reeks of history but there is nobody inside because the quirky beer garden affords beautiful views across the countryside to the sea. 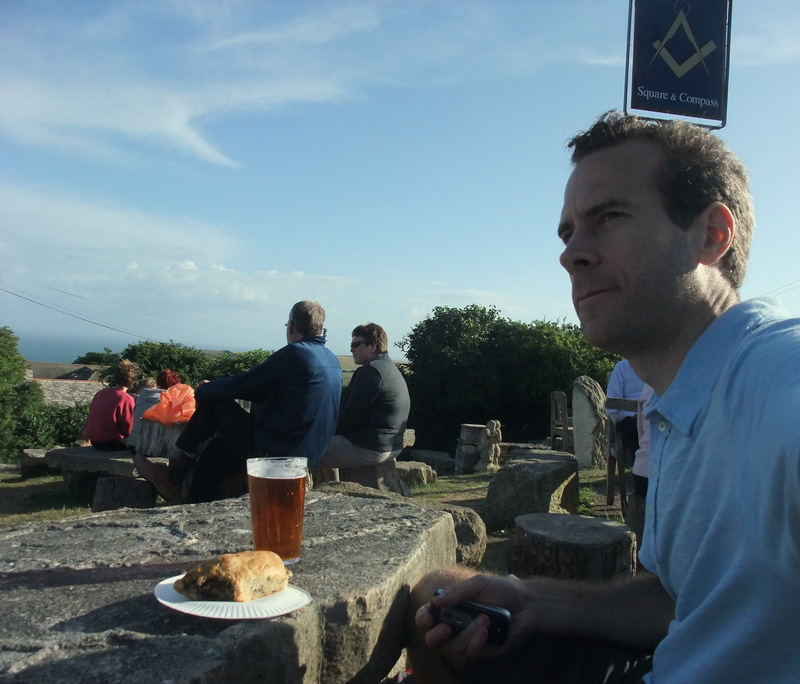 I choose ale and a home made pasty (that’s their only concession to food) and Steven opts for one of the many ciders. Over the course of our conversation I learn that Steven lives in one of my favourite cities – Berlin – on the central Friedrichstraße nonetheless. He bids farewell but not before handing me his business card and offering me a roof next time I visit the city. The sun is in descent over the ripening fields and their stone enclosures. The effect is simply inspiring and I only wish I had the skill/equipment to truly capture the spirit of this moment on my camera. (Note: my new blog header was snapped shortly after I left the pub). It’s an easy flat 4 mile jaunt across the fields along the ancient Priests Way back to my campsite and in the middle of nowhere I stumble across a few people with some serious photographic kit. What are they doing here I nosily enquire. It’s a Sebastian Faulks photo shoot for a forthcoming BBC2 feature. I know of him – he occupies a good tranche of the top 100 books in Waterstones – but I have never read any of his stuff and don’t recognise him. I think I’m almost home when I find myself in potentially dangerous situation. Cows are streaming out of one field, along my path and into the next field. There are hundreds of them and I can’t wait forever so I slot myself into the queue a respectful distance behind Ermintrude in front of me. All is well until a bottleneck ahead causes the procession to stall and then Daisy behind becomes a little distressed and starts to moo. 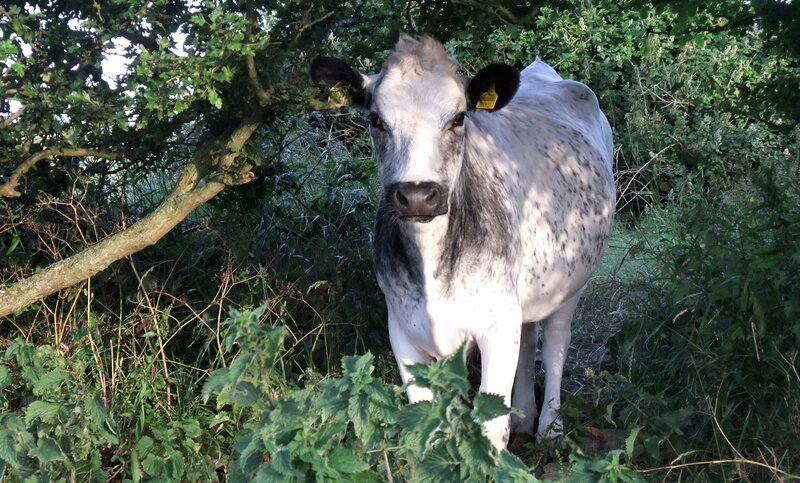 This spooks Ermintrude who tries to stare me out. I’m trapped. “Rambler found trampled – business card suggests German tourist” is the headline that comes to mind. It takes a little bovine negotiation to ensure my safe escape from this corridor of uncertainty. I return unscathed and resolve to eat more beef. 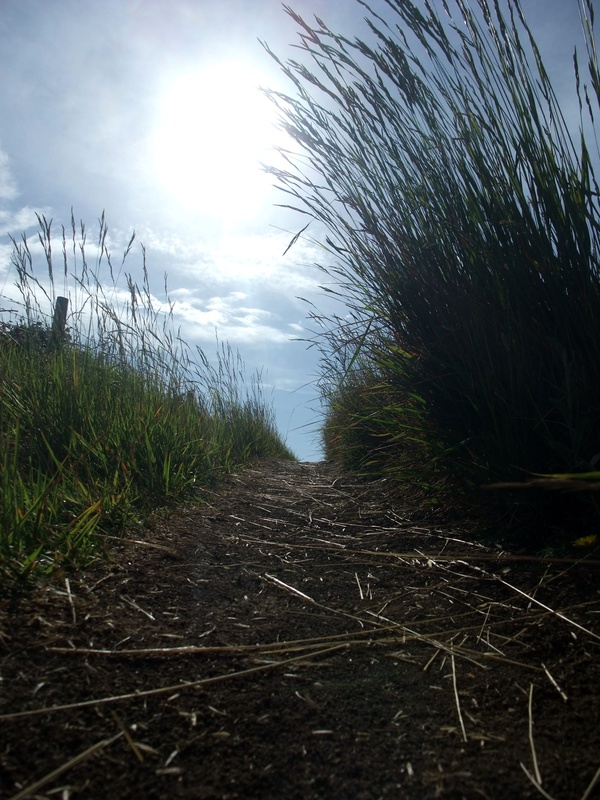 No walk Tuesday –my body refused to do hills. Evidently Monday’s journey was too much too soon. 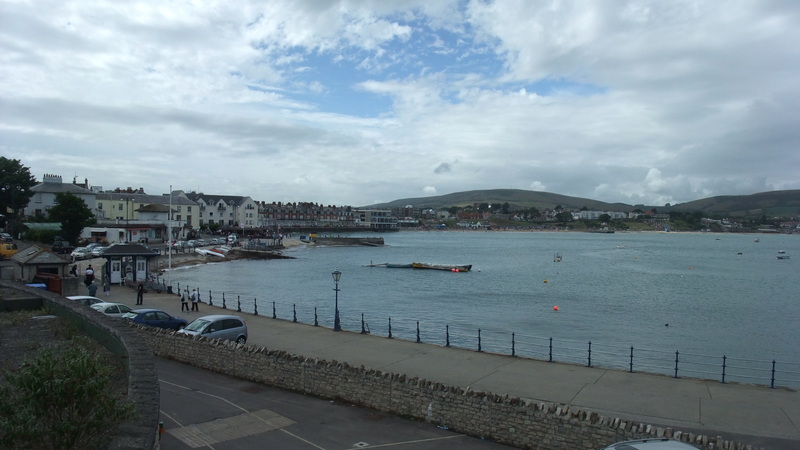 Here are some photos of Lyme Regis instead, a wonderful Devonian seaside town that I’m surprised to discover is in a different county to my campsite up the hill in Uplyme (Dorset). Lyme has a long departed history as an international harbour thanks in large to its protective sea wall. 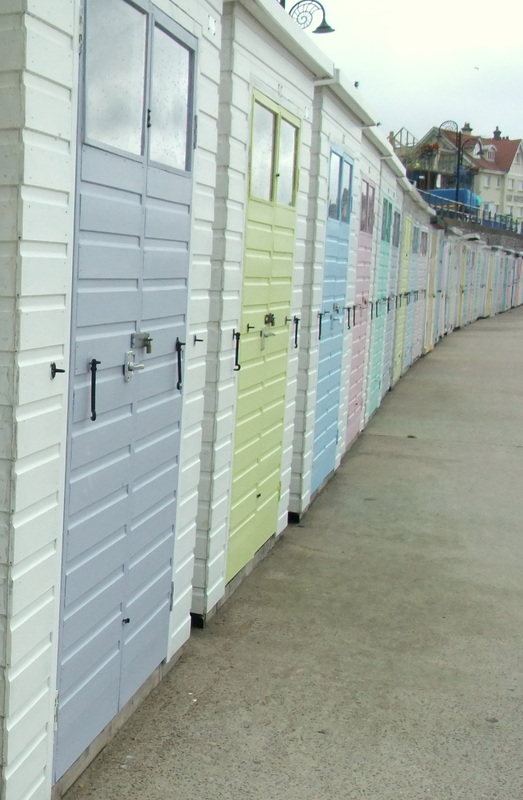 Today the promenade is serenaded by colourful beach huts that will presumably flower open in a couple of weeks when the school holidays begin. For now the threat of rain is ever present and mist shrouds the hills that were so clear yesterday. 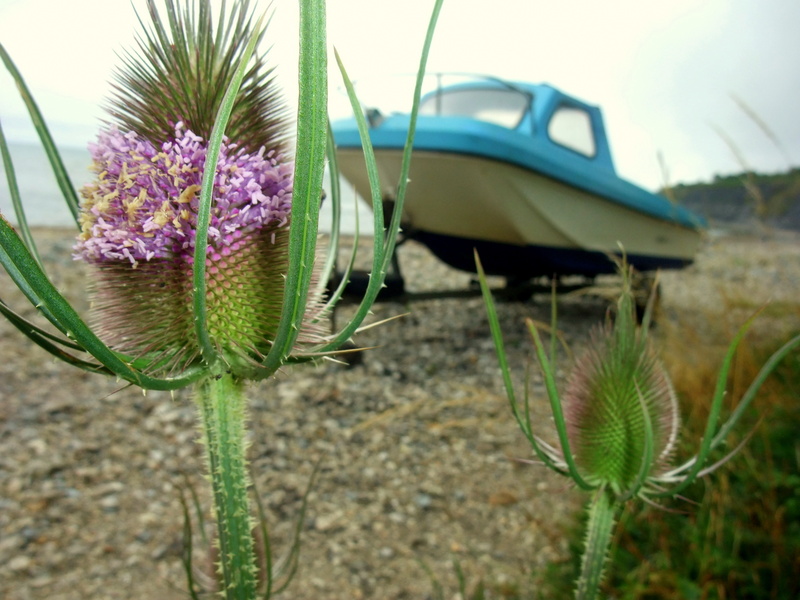 The Lyme Cob protects the harbour and it seems an entirely natural part of the landscape. 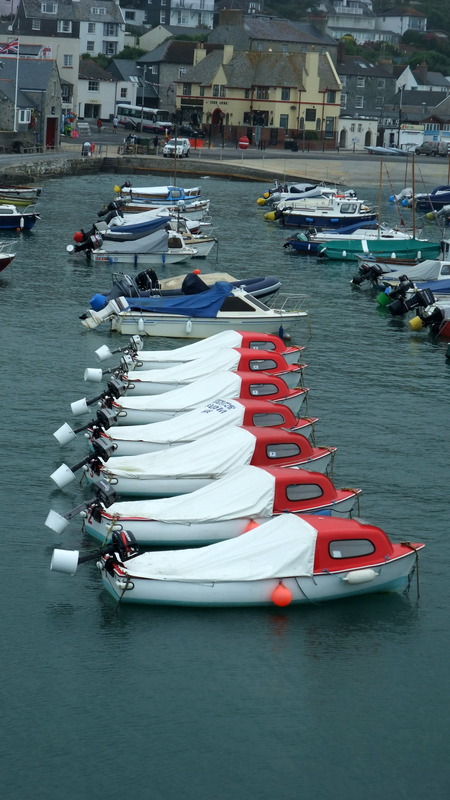 Most of the vessels here are for leisure and there are no fishing boats to be seen today. It’s hard to imagine the resort packed to the gills with sun seekers on such an overcast day but there remains an evocative quality of light which presumably goes some way to explaining the number of art galleries in the town. Up until now the days highlight had been an intense and moreish fish soup at the Bay Café and Restaurant but a chance left hand turn down an innocuous road blows that away when I stumble across the heavenly Town Mill Bakery. It’s one of those brilliantly simple concepts that plants a big smile on your face and has you questioning why there isn’t something similar back home. 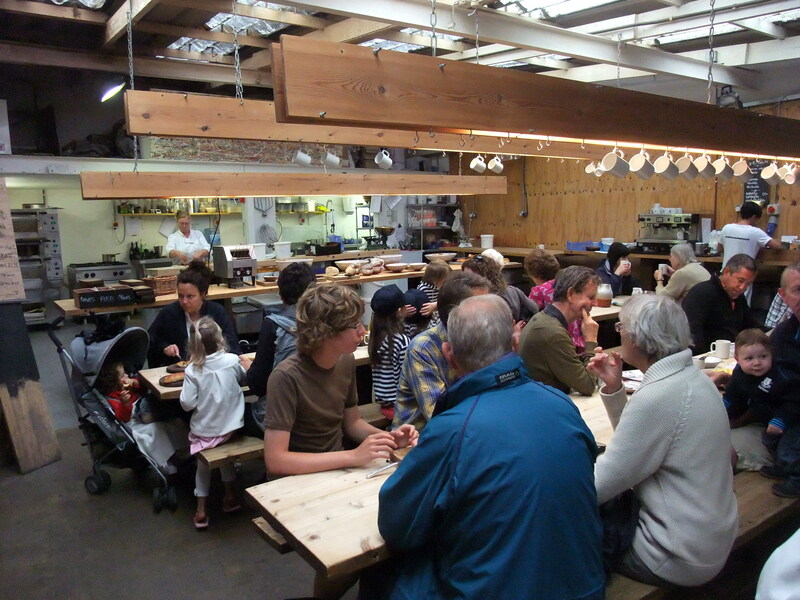 The bakery is based in a open barn style space with plenty of natural light. In the back half you can see the baking going on. 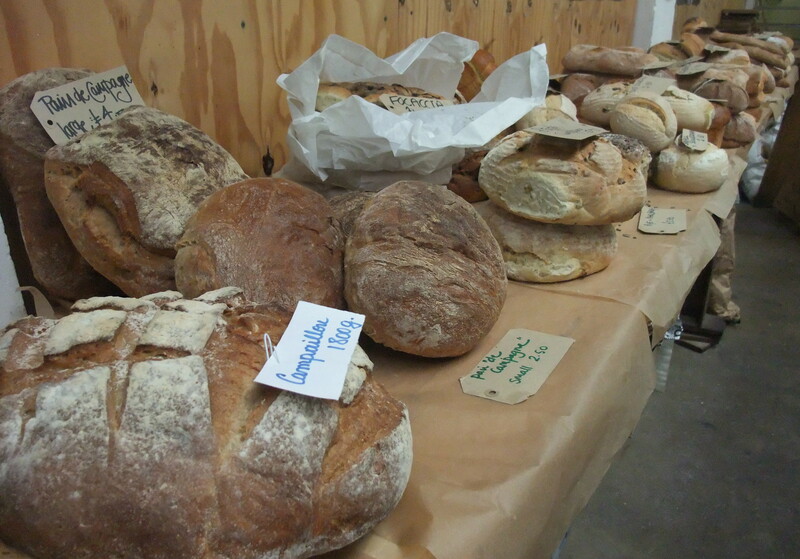 Then there’s a long wooden counter lined with fresh breads, buns, scones, etc. You grab a wooden board, pile on whatever you want, optionally request a fresh coffee and find a place at one of the three long trestle tables to east. You can cut as many slices of bread as you like and (optionally) toast them for £2 and there are huge bowls of butter and jam on the tables that your neighbours will pass if requested. I go back for more toast and could quite happily spend the rest of the day there eating toast, drinking coffee and reading. 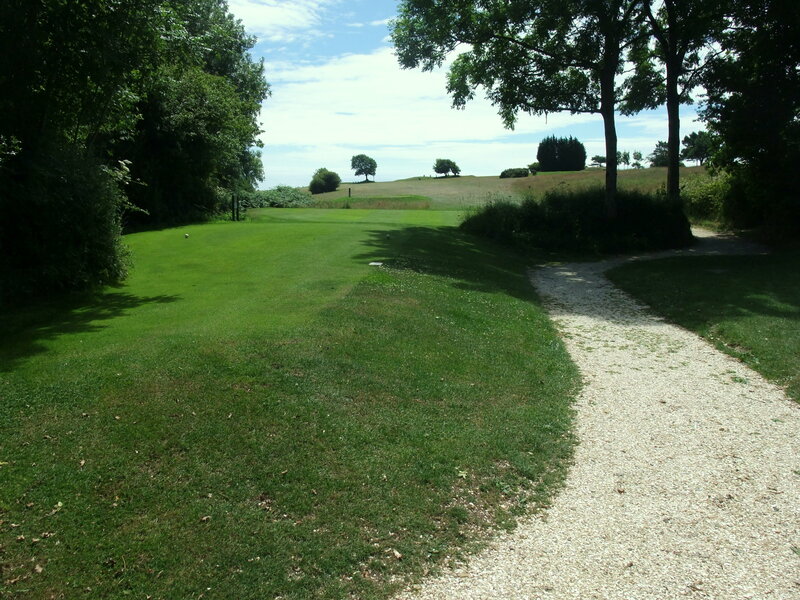 The experience is informal and relaxing. When you leave you tell somebody what you had they just trust you and take the money. A stones throw away I found a refurbished water mill complex with art galleries, a pottery and a (sadly closed) microbrewery. 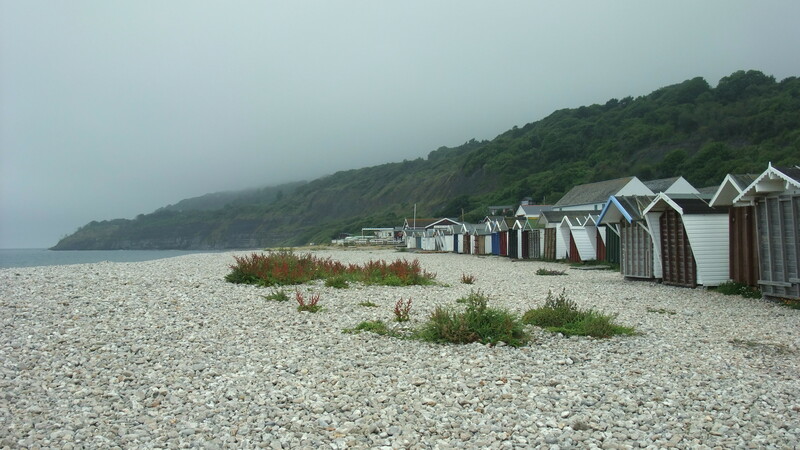 During my ramblings the Mist has turned to mizzle and onto haze and I head beyond The Cob onto Monmouth beach in search of the fossils that have made this section of the Jurassic Coast world famous. I’m not disappointed – there are plenty of rocks infused with 200 million year old critters. 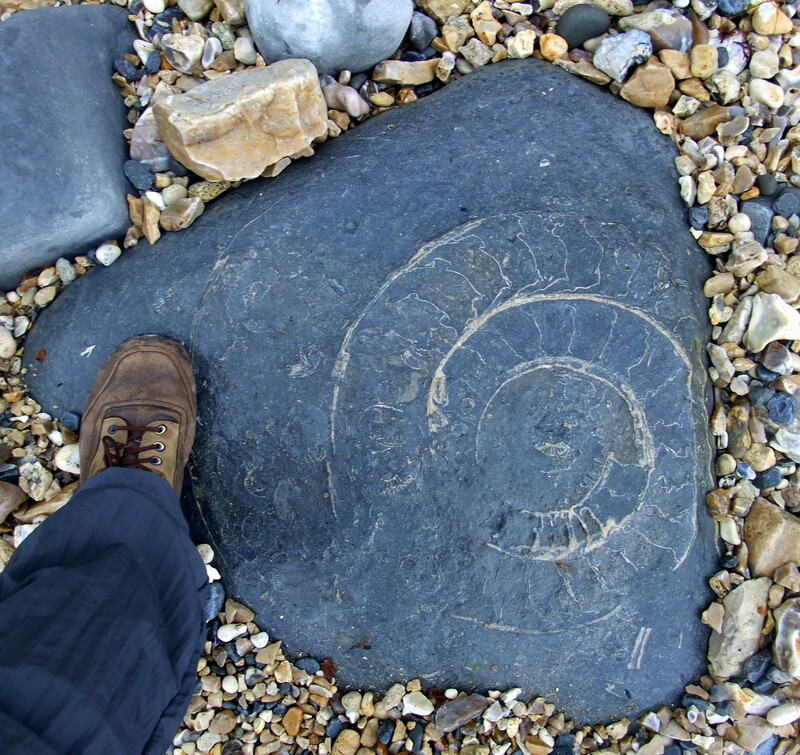 You can judge the size of the shell below by my size 10 foot alongside it. I can’t help feeling that if I were standing here around the time this thing was alive I would rapidly become afternoon tea for something with large teeth and scales. On a related point I popped my head into a couple of fossil shops and was disappointed to find many of the fossilised shells, fish and teeth for sale had been dug up anywhere in the world except the local area. That’s a taste of Lyme for you anyway. There’s a lot here and much more history to unravel if you have the time. Holiday season is probably best avoided but I may return one off-peak weekend when I fancy a change. Over the last month I set about writing a daily World Cup journal. 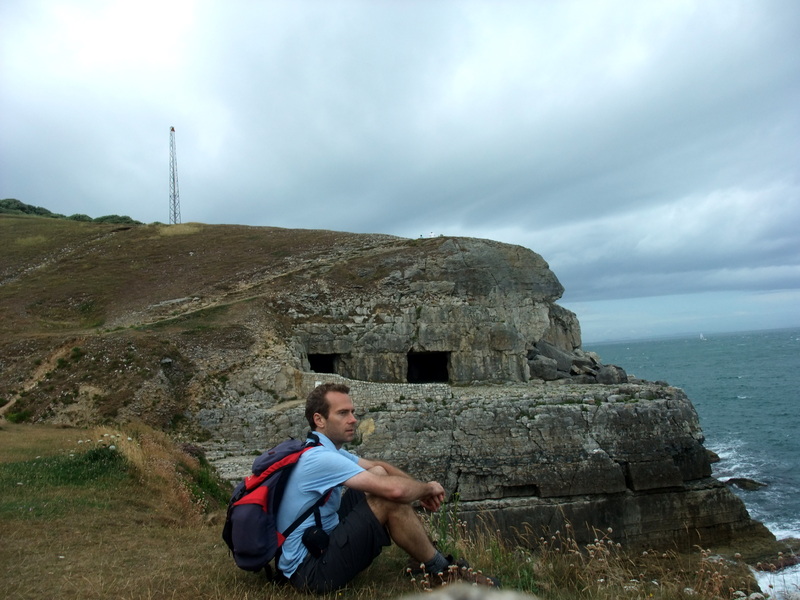 On Sunday (world cup final day) I drove south to Dorset to spend a week walking and not blogging. After one day I find myself writing this blog entry and contemplating a week that may hold no further walking due to weather forcasts that suggest I should build an ark. So much for intentions. 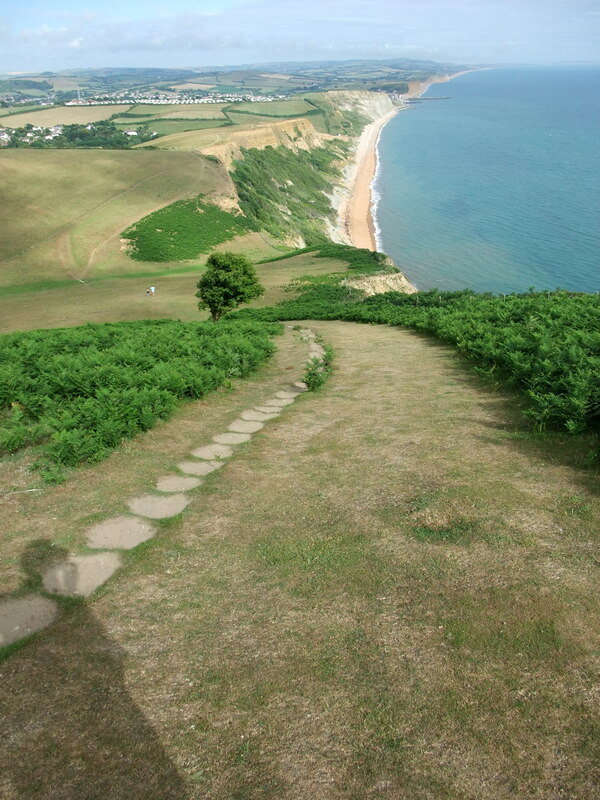 I chose Dorset because I wanted to walk by the sea in an area I didn’t know. 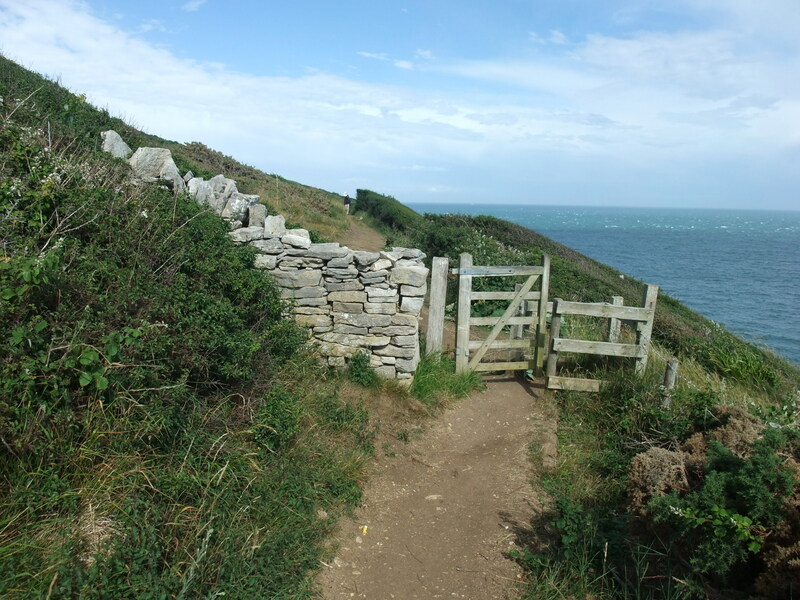 The wonderful South West coastal path extends out of Cornwall and through Devon into Dorset. 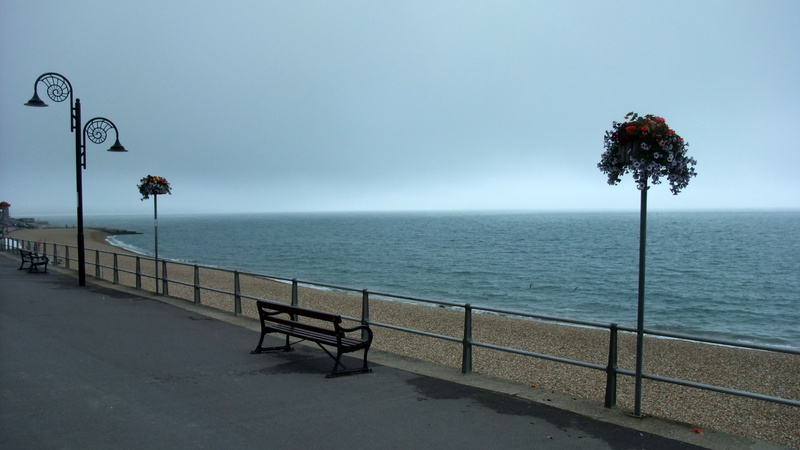 Yesterday I arrived in Lyme Regis, donned my suspiciously clean walking boots and headed east. 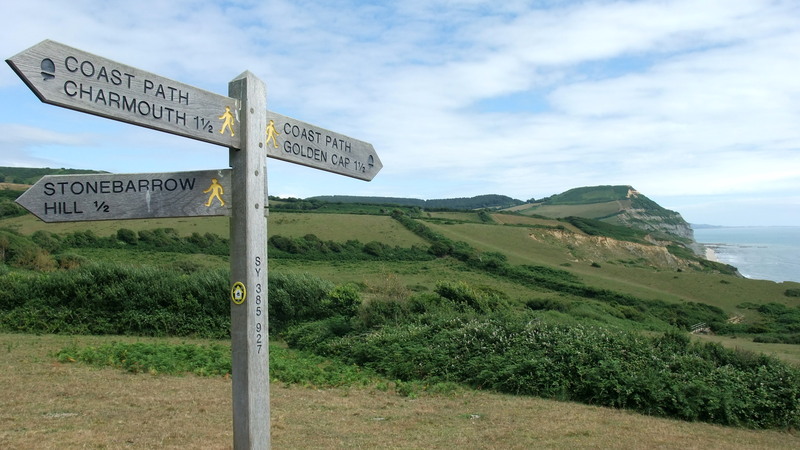 This region is renown for coastal erosion and so it was no great surprise to discover a fairly major diversion inland for the first leg of my walk from Lyme over a links golf course into Charmouth. It always happens when I walk past golf courses. I’m hopelessly attracted to them. 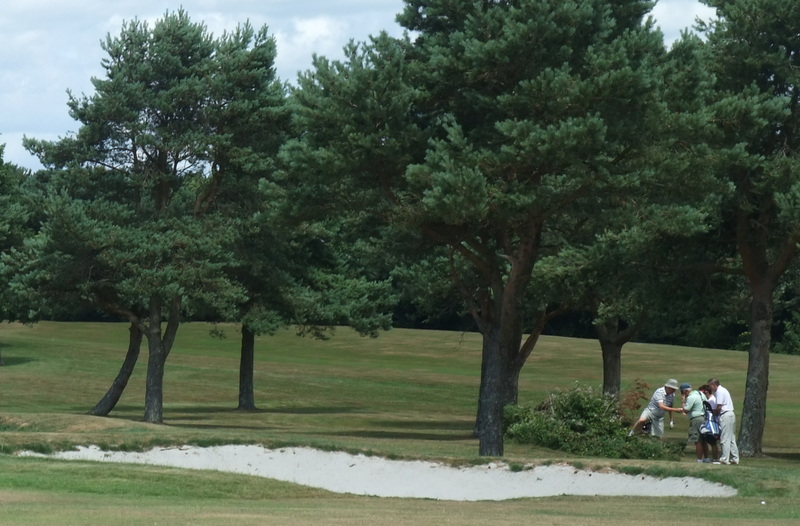 It’s the perfect trimmed grass on the greens and the tee-off areas. It’s the uniform fairways. It’s the pristine paths. It’s the hand painted yardage boards. It’s also the fact that I’m sweating in the sun after a major hill climb with much more severe to come when I could be hitting a ball around with gay abandon. Truth is, I haven’t swung a club in anger for over ten years and last time I did, well, it made me angry. Onward past the hackers, through the car park full of BMW cabriolets and into charming Charmouth. There’s a market today and I’m in a pottering mood so in I potter. It’s beguilingly familiar with clothes stalls, Asian businessmen selling everything from chisels to batteries plus the ubiquitous meat man selling pork by the pound to people who didn’t know they wanted it but were drawn in by his sales patter. You could be anywhere if it wasn’t for the west country accent. I have resolved to be healthy this week as I am patently unfit and overfed by my normal standards. The gorgeous lemon drizzle cake that foist itself upon me is dealt with rapidly as if to minimise the window of guilt and my stride up a gruelling steep ancient byway is more urgent than it might otherwise have been. I have an admission to make and hopefully my hardened walker parents aren’t reading this or I will be in for some stick. My preparation for this walk has not involved the acquisition of a map. Look – it’s a coastal walk. If I get wet I’ve gone too far south. The only real issue here is that I don’t know exactly how far I’m walking or what elevations I should expect to encounter. Fortunately the coastal path is well signposted as expected, even when land slippage has resulted in detours inland. Like all the best summits Golden Cap cons you into thinking it is closer and lower than you think. It’s no big deal in the scheme of things, certainly nothing compared to last years Lake District jaunts, but for my first walk in six months on a hot day the climb takes a bit out of me. Luckily there are myriad reasons to break the ascent. Wild flowers carpet the hillside and the coastal views demand my attention in either direction. The superior altitude of Golden Cap provides a perspective on the landscape not immediately apparent from lower down. 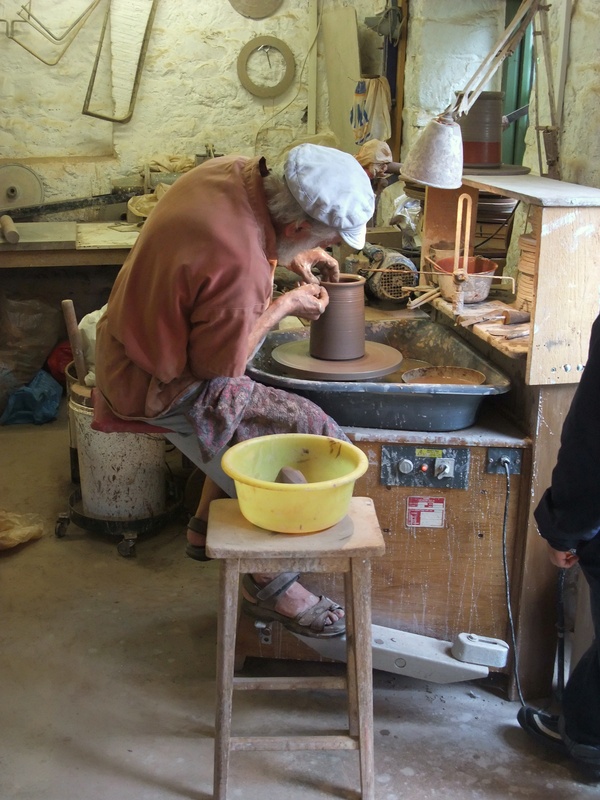 It’s not just the bays either – the farmland to the north is compelling in its own way. 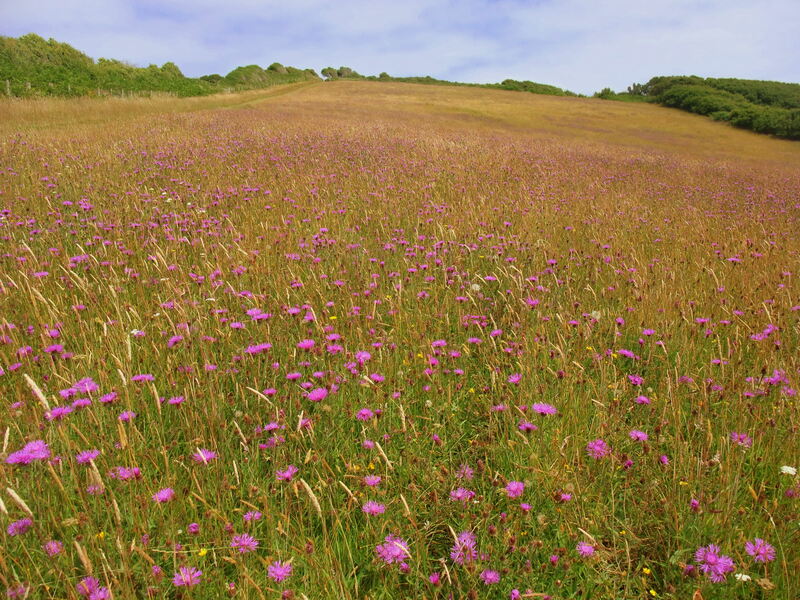 The rolling hills have been worked for time immemorial although any sense of permanence is an illusion – coastal erosion means these fields are living on borrowed time. From the highest point down to sea level at imaginatively named Seatown. There isn’t much here other than a shingle beach and a fine old pub but conveniently those are the only two things I crave for right now. A pint of something local and delicious allows time for me to air my abused feet and read another chapter of the travel writers booked I picked up from my own pub last week for 20p. I’m not a prolific reader but I like to read about places I am travelling to, or in this case places other people are travelling to. I may appear to be sat outside a Dorset pub but I am in fact sitting on an Italian commuter train engrossed in social contrivances as witnessed by the author. Every hiker knows that feeling after the lunchtime pub stop when the stiff limbs are called upon to scale the next hill. The next peak is a shadow of Golden Cap but doesn’t feel it. The view back east provides some reward at least. 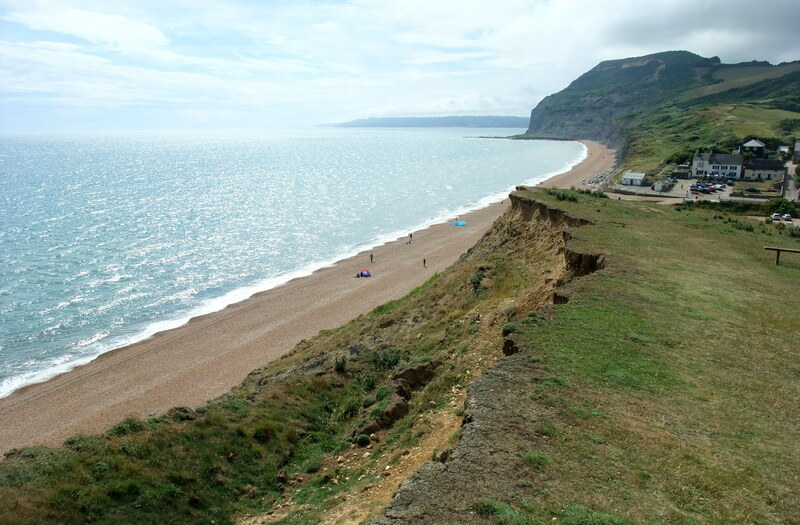 My destination is West Bay and now it is visible ahead, prodding out beyond the cliffs, actual distance unknown. As the path descends gently into West Bay I come across a bench (thankfully nobody died to get this one erected) and I consume the nectarine I purchased back in Lyme. I often ponder the improbable journeys undertaken by fruit. Somebody grows a plant in southern Europe or South America, the goods are harvested, shipped to Northern Europe, distributed regionally by lorry and bought by locals (or visitors like me). It seems reasonable to expect the purchaser to take said item of fruit home and fulfil its anticipated destiny, but further fruit miles may be incurred as in today’s coastal relocation. I have been known to ferry fruit to and from work for several days before consigning it to my compost bin in a state of decay. If reports are to be believed the British public compound their under-consumption of fruit by chucking a quarter of it away uneaten. All in all it amounts to a contrived voyage that may or may not conclude digestively. I blame my dalliance with fruit miles on the boredom one has to deal with when awaiting a bus in a place that has less attraction than the time available demands. West Bay centres around a modest marina of sorts. There’s a couple of cafes, a pub and a few fish and chip stalls for the tourists but that’s about it. My bus back to Lyme Regis runs every two hours and with 75 minutes to wait I read my travel book in a bus shelter with a cup of coffee as the rain arrives. I’m tired, achy and just want to get back.